Warning!! This material has the potential to blow your mind! Proceed with caution. After two years of full-time reseach, pondering and writing, Mystical 2012 was published as a paperback in the summer of 2010. In February of 2012, the book was expanded and the cover was updated to include an endorsement from Graham Hancock and a new photograph was used. At that time, the book became available from Amazon both as a paperback and in ebook format. Important note now that December 21, 2012 has passed: My book and free essays on the Maya calendar were ignored by the general public because I always maintained that the ancient Maya did not create the calendar as a prediction of any sudden shift in our world, good or bad. My opinion that their message is the profound, timeless non-dual message that all mystics bring forth did not appeal to very many people. Yet now that December 21, 2012 has come and gone and nothing of note has happened, perhaps you will be interested in giving my work a closer look. 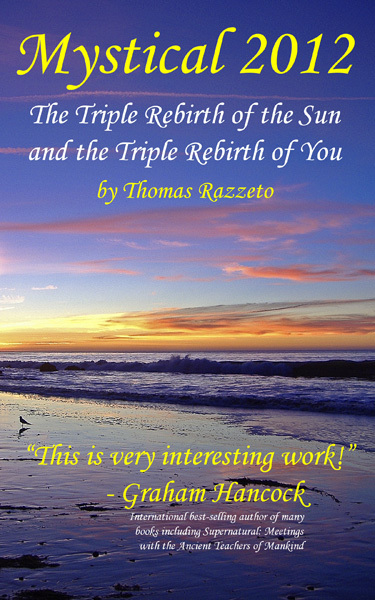 In both my free essays and my inexpensive book, I go over the actual astronomy of 2012, which the Maya saw as the sacred triple rebirth of the sun. (Don't worry; this is more like art than astronomy! It's easy to understand the pictures in the sky that the ancient skywatcher visualized.) While the astronomy is fascinating to me, much of my work was devoted to pondering the core meaning of the Long Count calendar. For me personally, the discovery of this material was totally mind-blowing. Perhaps you will have a similar experience! I hope you enjoy my work on 2012! The astronomy that will unfold in the sky over the Maya on the winter solstice of 2012 is the key to understanding why the Maya restart their calendar on this exact day. My work makes it easy for you to learn why the Maya metaphorically saw this astronomy as the sacred triple rebirth of the sun and when you also consider the special configuration of the sacred tree, you have a more complete picture of why the Maya picked this precise day. But what is the core meaning of this metaphor? Did the Maya's psychedelic rituals reveal to them a mystical view of reality? Did they see the greater reality that lies behind our ordinary reality and did they awaken to their true fundamental identity? Is this the profound spiritual rebirth that they hold forth as so important and available to you without drugs at any time, not just in 2012? Yes! The more I dug into 2012, the more mind-blowing it all became! Perhaps you will have a similar experience! This is not the complete book but it similar to the book. It contains many excellent pictures and diagrams. This link makes it easy to print the complete 35-page essay. This is an Adobe PDF file formated for 8.5 by 11. Over 100-pages (5.5 by 8.5). If you are inspired, please leave feedback in Amazon’s “Customer Reviews” section. Note: You can leave feedback even if you don't buy the book at Amazon. This is the best way to help me out. This has the same content as the paperback. Please leave feedback in Amazon’s “Customer Reviews” section. Note: You can leave feedback even if you don't buy the ebook at Amazon. This is the best way to help me out. more profit for me. Yet you can still leave comments on Amazon to help me. • Are you new to my ideas about 2012? And more essays are coming soon! Yes, I know; people often wonder how I can expect to sell any books when I give away so much information for free. My goal is to have as many people as possible learn about Mystical 2012 and giving away plenty of information is a good way to do this. To learn more, click here. If you enjoyed reading Mystical 2012, please consider writing a review for Amazon’s “Customer Reviews” section for Mystical 2012. To do this, you will need to have an account with Amazon but you do not need to order the book from them. Writing a review is one of the best things that you can do to help me out so I greatly appreciate it when you do so. Even just a few words can be very helpful. If you are inspired, here is a 48-minute lecture that I gave in October 2010. In this narrated slideshow, I cover both the astronomy of 2012 plus the core meaning of the Maya's timeless transformation and rebirth metaphor, which is what the astronomy is pointing to. Learn about the astronomical cross that will fly through the sky over the Maya on the winter solstice of 2012 and why the Maya saw this special day as containing the sacred triple rebirth of the sun. After you see how I present the astronomy of 2012, you might wonder how so many people can be completely unaware of this simple but important perspective. (And, no, my work does not have anything to do with the galactic alignment of John Major Jenkins. I really like John and we had become friends via email. I guided him in getting started in self-publishing in early 2013 after his publishers lost interest in his work. I was saddened by his passing in early 2017. But John's galactic alignment already happened in 1998 and I don't think that the Maya missed what they were aiming at by 14 years. I think that they hit exactly what they were aiming at: the sacred triple rebirth of the sun and the sacred tree in the sky over the Maya.) I have unique information about 2012 and a presentation style that makes it easy for you to understand so please check out this video. Thanks for visiting! Have a magical and mystical day! Copyright 2013 Thomas Razzeto - All rights reserved.